Former Knesset member Moshe Feiglin, chairman of the Zehut party, spoke this evening (Tuesday) to two-thousand participants at the party convention held at Hangar 11 in Tel Aviv Port. Feiglin introduced the new party's principles and referred to the report on Operation Protective Edge: "Everyone is talking about the Protective Edge report, while ignoring the basic facts: the government sent soldiers into boobytrapped alleyways in order not to win. "Decision makers feared the collapse of Hamas and did not actually strive to defeat it, and we have achieved a stalemate with an ephemeral terrorist organization. Unfortunately, if the situation continues, our sons will return and be sent to the alleyways of Gaza also in the next round," warned Feiglin. Feiglin also discussed his political program and called for ending the occupation, as he phrased it: "We shall apply the sovereignty of the State of Israel to the entire expanse of our country, and we will develop the country for future generations. Zehut will guard the human rights of its citizens, including those who are not Jews. Arabs in Judea and Samaria will be offered various options: Continue living as permanent residents, immigration assistance for those interested, and citizenship for those who prove loyalty to Israel and become partners in maintaining security." 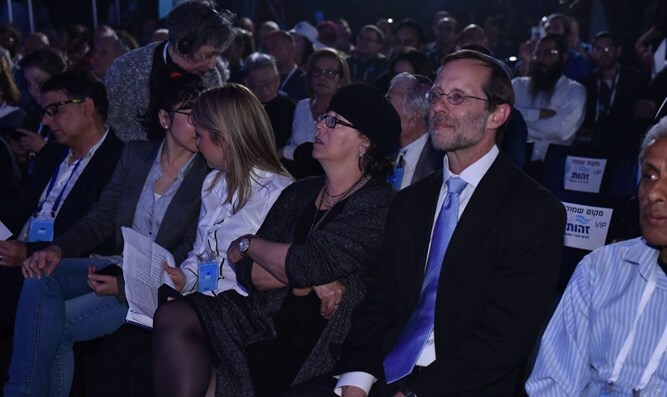 Feiglin stressed in his speech, "We are participating in an historical event, an event in which we begin to restore the country to the people. The Zehut party finally presents a clear vision to the State of Israel."